My home computer collection is ever changing. In fact, one month ago no computers were where they currently are. I guess I should start out with my Macintosh history before I follow it up with what I have now. Three years ago today (as I've just found the original packing slip), I received my first real Mac to replace my used up and tired SE/30 (it still works). It was a lime iMac 266 with 96 MB of RAM, and boy was that fast! A couple of years after that, I decided that I needed some portability in my life, as I got pretty tired of typing up all of my articles and "big boy" Junior High papers up in my room at my boring old desk. So for about $350 I picked up a refurbished PowerBook Duo 280c with the floppy drive and all the bells and whistles. A few years later, my sister wanted her own computer, and after first giving her the SE/30, which had been shelved in our basement, we decided to buy her an older LC III from a reseller on eBay, since she really needed a more modern Mac with color capabilities. This computer was great; it gave me a great chance to gain some experience in ethernet networking, as the only other experience I've ever had before was with just plain old Mac-to-Mac serial networking. However, thanks to a faulty At Ease install, the hard drive was wiped pretty bad, and it would not reformat. Getting a new hard drive was out of the question considering the price compared to what the computer was worth. So we replaced it with a Performa 6320CD with the TV Tuner Card, 15" AV monitor - the whole works, in fact. It had just been sitting around in my Grandpop's basement for a year, since he decided to upgrade to a faster PC. But this was fine for my sister-- until I broke it not one day later while trying to install an ethernet card. A few pieces got knocked around inside of it, one piece hit the heat sink (I think), and it would no longer boot, sad Mac and all. You should see a ten-year-old girl scream at the Sad Mac. It did give her a pretty good scare. So, once again, I was off to eBay to replace yet another Mac. My mom was not happy at all. But I decided that the only thing that would keep me out of breaking her new computer by toying with it would be to give me the new computer. 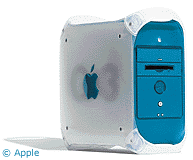 So today, three years after my very first newer Mac experience, I received my brand new (to me at least) Blue and White G3/350, complete with MS Office, OS 9.2.2, 192 MB of RAM, and an &degr;Que! Combo DVD/CD-RW. Everything works great. My sister now has the iMac, and I've finally fixed up both the LC III (using an external hard drive) and the 6320 (with my bare hands and a pair of scissors to finally get it open - darn "security" screws). As far as my plans for the future are concerned, all I really plan on doing is eventually, maybe even tonight or tomorrow, set up the Performa 6320 as our server. As you can see, over a three year period there have been six different combinations of Macs between my sister's rooms, and they and mine have all been networked, thanks to my trusty Netgear four port hub. Got to love it. As for my mom, you ask? Her six-year-old Gateway is just fine.